2014 is a great year for us. Though it didn’t make our portfolio grow enormously, at least it grows around 4.5% overall. As you know, I am the sole breadwinner now as my wife stops working to take care of our baby Francis. The growth may seems slow, but at least we are not sacrificing our family. Here’s our current portfolio at the start of 2015. Overall, our pooled funds grow around 15%. 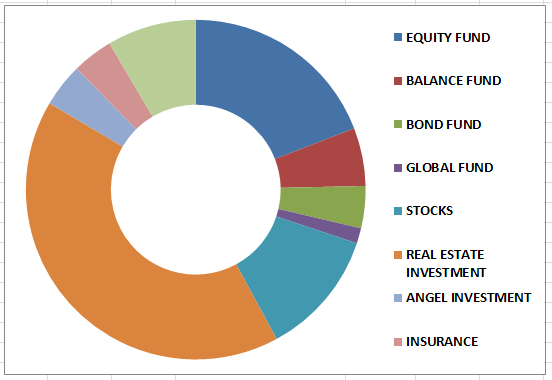 These includes both local mutual funds and global funds in all asset classes: bonds, balance and equities. Much of our emergency funds are used last year. Being a sole bread winner now, and sometimes my salary is not enough to cover all expenses. Especially those plane tickets from here and there. For 2014, I have added INSURANCE in our portfolio. This is a significant change of heart as I learned more the value of risk protection with respect to all that we have. As breadwinner, I got insurance protection from all aspect: Life, Medical and Accident. My total life sum assured now is around S$500K, just enough amount to make sure my family will live comfortably in the event something happen to me. I also started Angel Investing. This is a new opportunity with a great potential. I will not discuss more about it, I will try to blog separately. For this year 2015, I will continue to insure my wife and baby against all risk that might happen to them. By doing this, I am also ensuring the protection of our overall portfolio. I will try to rebalance our pooled funds portfolio and try to shift some non performing funds to higher risk asset class investment. Adding more funds to them is one of my goal for this year. And I need to work hard to make it happen, earn more and spend less. Previous: Life’s Risk: Are you well protected? Anong magandang bank na pwedeng mag invest sa UITF. try BDO 🙂 or Security bank. but bank is just one thing, you need to know which UITF fund you will invest. maraming klase yan at each banks offers not only one fund to invest. find the one that suits your investment needs. If possible, can you please let me know kung ano pong insurance na may life sum of around S$500K as you mentioned? Is that 500,000 singapore dollars? im interested to know more about the amgel fund. can you provide a brief description. more power to you. you are helping a lot of our kabanayans!! hope we can do the same here in tokyo. Hi! Your blogs are informative and helpful in making my decisions to invest in the stock market and UITF. Will join the Truly Rich Club tomorrow by paying the discounted membership price knowing that you’re a member of TRC. I have read some blogs on investment and convince to invest my hard-earned money. I would like to ask advise about investing in mutual funds. Which one is better COL mutual fund or directly to the company? If COL is it really safe to invest in them? mutual fund thru COL is better 🙂 COL is a publicly listed companies, so i trust them to be safe. but for my investment to be safe, its up to you po what company you will invest.